I’m also calling this my “Frozen Cowl” simply because we seem to watch that movie every day. Every. Single. Day. And surprisingly, I get get one cowl made while watching the movie with our Frozen fanatic which is really a double win for this mama. In this case, we’re talking about knitting needles and yarn weight. [Sorry folks if I lead you to believe this was going to be a dirty post. 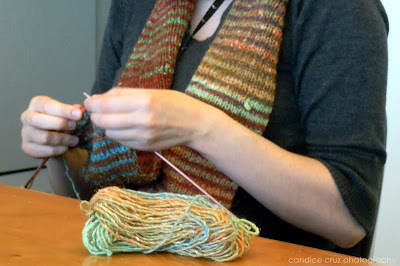 🙂 ] Back in the day when I worked at a craft store, I taught a few people how to knit (and a couple of my coworkers at my current job over the past couple of years too, come to think of it). One of the key things to explain to someone who is new to knitting is the importance of using the same type of yarn that a specific pattern calls for. Of course, there are other terms such as gauge and tension (here I go with the nerdy-knit-talk) but that’s a whole different discussion. The other day I went online searching for a cute and relatively easy baby sock pattern. I came across this one and decided to try it because it was from the top down, it didn’t have any tricky stitches I didn’t already know how to do, and I loved the texture of the ribbing in the final product. For those of you knitters/crafters out there who know me and my fondness for Debbie Bliss cashmerino yarn, you will probably not be shocked to find out that that’s the first ball of yarn I reached for to make my first pair of these cute socks instead of a ball of fingerling weight yarn that the pattern called for. And for those of you who were my past students, you’ll remember that it’s the yarn label that tells you which size needles to use, right? In this case, I used size 8 double pointeds and decided to make the newborn size in the pattern. I don’t think this is a good idea if you really wanted newborn sized socks. Unless your newborn is born the size of a 3-year-old. Then maybe. I know it has been a while since I’ve posted anything really craft related on this blog but truth be told, I’ve been in quite a rut. It’s also been a while since I’ve posted anything about the going ons within my knitting group at work. 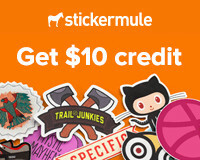 So hopefully this post will satiate both and get me back on the crafting radar. My friend Jess is like one of the best knitters I know. And I mean, seriously, she is a really good knitter. Not only is she good at it, she actually completes projects. (I have so many WIP’s — in the knitting world that translates to “works in progress” — it’s pretty shameful.) Anyway, she brought in this scarf to our knitting group one day and I just knew the instant that I saw it that I had to make one too. I just love it when inspiration jumps at me like that. 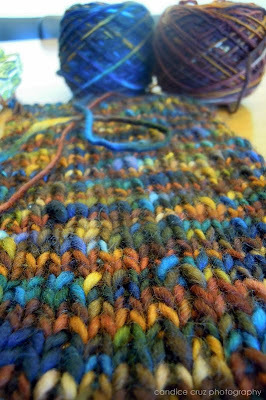 It’s a pattern that Jared Flood blogged about and she used Noro yarn like he did. I love how her stripes turned out, don’t you? I had some Manos del Uruguay yarn in my stash and of course, I need to use the yarn I have before I buy any more, so I decided to try making the scarf with it instead of buying new stuff. 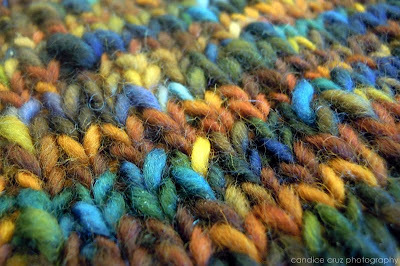 I tried to pair a skein of multi-colored dark blue and gold tones with a really bright turquoise skein I have, but it just looked awful. So I caved in and made a drive out to Windsor Button in downtown Boston one afternoon and found a skein in a more golden brown and orange colorway that I thought would provide enough contrast. 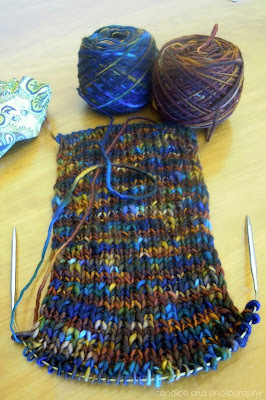 It’s my “do at work during my lunch break project”, so I don’t bring it home (I have the hubby’s sweater to work on at home … yes, that will take a long time) and as a result, I usually only get in about 4 rows each time I sit down to work on it. Needless to say, it’s slowly coming together but I intend to give it to someone (won’t say who here even though I know he doesn’t read my blog) for Christmas so I have plenty of time to complete it. The striping is very subtle and at first I was quite disappointed, but over time I have started to really like the coloring. I hope the person I am making it for likes it, which is most important, and I think the colors are masculine enough. Stay tuned. Hopefully I can get this one complete before the summer ends! 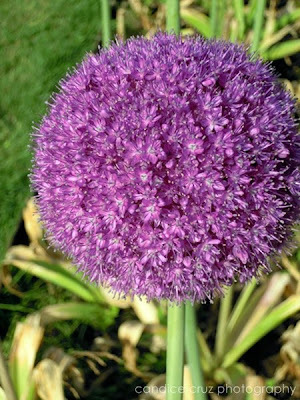 There’s something about allium flowers that grabs my attention each time I see them. I don’t know if it’s because I’m in awe of how perfectly round they seem to be, or if it’s the bright purple color of the petals. So, where was I going with this? Oh yeah … so I made this special drive out to downtown Boston and actually managed to find a parking spot (thank you, parking angel!) 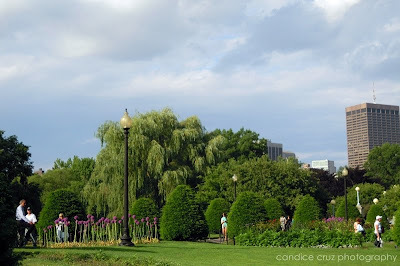 next to the Public Garden. I went along and bought the yarn, and then on my way back to the car decided to take a quick stroll through the garden. Why not, right? It was a gorgeous spring day, I didn’t have anywhere to be in a hurry, and I could use the exercise. 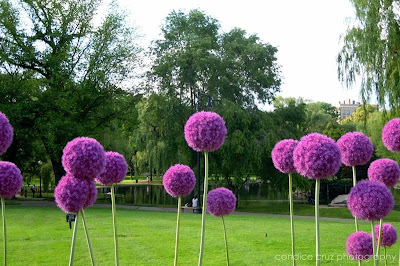 Oh, and the alliums were in bloom! So pretty. So tall. So purple. So spring. So step-carefully-over-the-chain-onto-the-grass-for-a-quick-photo-opp worthy. And it was also nice to see so many people out enjoying the weather. 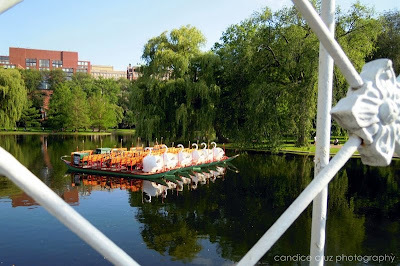 I loved this scene of the swan boats at rest. Of course, as I write this — fashionably (?) late mind you — I look at these photos I took a couple of weeks ago and our park just pales in comparison to what we experienced in Chicago. More from that trip to come soon!